Up to 5 Toppings. Extra cheese is extra. Available 4:30 pm to close. Available from 11am to 8pm. Prices are not valid with other offers and do not include tax. Four thick slices of French bread with that garlic flavor you love, toasted until it’s golden brown with a side of Corky’s homemade pizza sauce. Four thick slices of garlic bread topped with lots of melted mozzarella cheese with a side of Corky’s homemade pizza sauce. 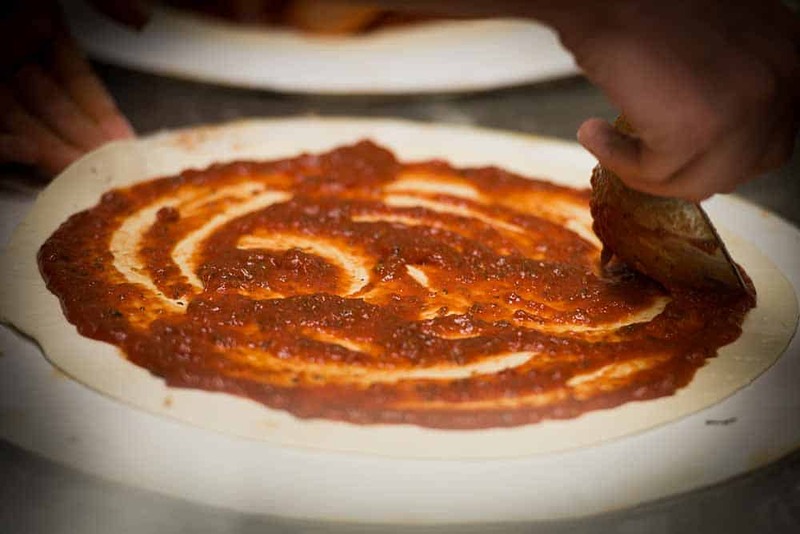 Our pizza dough is handmade daily from scratch. Combine that with our homemade sauces, fresh ingredients and our mozzarella / provolone cheese blend. All finished off in our stone oven for that classic pizza you love. 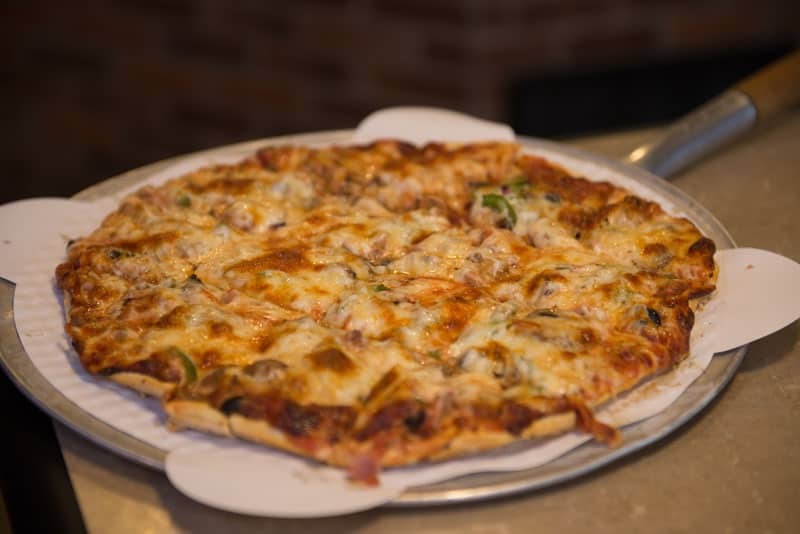 Choose from one of our specialty pizzas or create your own custom pizza. Choose from one of our specialty pizzas. Sausage, mushrooms, green peppers, onion, choice of olive. Taco sauce, taco meat, black olives, onions, lettuce, taco chips, tomatoes, cheddar cheese. Sausage, pepperoni, mushrooms, green peppers, onions, green olives, black olives. Hamburger, sausage, pepperoni, Canadian bacon, bacon bits. Mushrooms, green olives, black olives, onions, green peppers, tomatoes. Ranch, roasted garlic chicken, tomatoes, bacon bits. Canadian bacon, green peppers, tomatoes, pineapple. Create your own custom pizza from any of our fresh ingredients. A delicious deep dish pizza which includes your choice of ANY ingredients (Up to 7 toppings). Served Thursday – Monday starting at 5:00pm as long as they last. All of our sandwiches are served with a pickle spear and seasoned kettle chips. Thin slices of lean ham stacked high. Served on a grilled bun or wheat bread and topped with melted cheese, lettuce, tomato and Corky’s special sauce. Served hot or cold. Succulent slices of our Mesquite smoked turkey stacked upon lettuce, tomato, mayonnaise, two strips of bacon and a slice of Swiss cheese. Served hot or cold on grilled wheat or a bun. A local favorite. Lots of tasty chicken on this one. Served on grilled wheat bread with lettuce and tomato. Classic lunchtime favorite. Light and tasty, we start with four strips of crispy bacon, piled high on fresh lettuce, tomato, mayonnaise and served on toasted wheat bread. Try it with jalapeño bacon. We feel it’s one of the tastiest sandwiches around. A generous Haddock fillet grilled to perfection. Served on a grilled bun with lettuce, tomato and Corky’s special sauce. A plump and juicy chicken breast grilled to perfection. We top it off with mayonnaise, lettuce and tomato on a grilled bun. Try it with our tangy barbeque sauce on the side. American cheese on grilled wheat bread. Our delicious grilled chicken breast with two strips of bacon, lettuce, tomato and ranch dressing on a grilled bun. Served with your choice of ketchup, mustard, onions or pickle relish. Our delicious chicken breast topped with crispy jalepeño bacon, Pepper Jack cheese, diced jalepeños, lettuce, ranch dressing and tomatoes on a grilled bun. Creamy macaroni & cheese served with a slice of Corky’s garlic bread. All of Corky’s burgers are 1/4 pound 93% lean ground beef, served with a pickle spear and seasoned kettle chips. If you’re hungry, this one’s for you. A juicy beef patty grilled to perfection with your choice of melted cheese topped with sautéed fresh mushrooms, stacked upon crisp lettuce, tomato, fried onions and Corky’s special sauce. A fresh beef patty, teamed up with two slices of melted cheese and topped with sautéed fresh onions on grilled wheat bread. Our lean beef patty, grilled to perfection. We top it off with your choice of melted cheese, lettuce, tomato and pickles on one of Corky’s grilled buns. A mini burger served with delicious fried onions and sliced pickles. See how many you can eat! A juicy cheeseburger, ranch dressing, crispy bacon, layered over lettuce and tomato. Your choice of American, Cheddar, Swiss or Pepper Jack cheese on Corky’s grilled hamburger bun. Served with pickles. A juicy beef patty grilled up and covered with your choice of melted cheese, red ripe tomato, crisp lettuce and mayonnaise. Sautéed mushrooms piled high with melted Swiss cheese on Corky’s grilled hamburger bun. Lean beef patty, crispy jalapeño bacon, Pepper Jack cheese, lettuce, diced Jalapeños, mayo, and tomato. Fresh hamburger on one of Corky’s grilled hamburger buns. Served with pickles. Piping hot, hearty soups served daily. Ask your server for today’s selection. Lots of beef, beans, tomatoes, onions and chilies makes Corky’s homemade chili pleasantly hot. Topped with grated cheddar cheese and served with crackers. Crisp Romaine lettuce topped with our delicious salad fixings – crunchy croutons, crispy cucumbers, ripe roma tomatoes and grated Cheddar cheese. Served with your choice of dressing. Crisp Romaine lettuce topped with tender slices of roasted garlic chicken, crispy cucumber, roma tomatoes, grated cheddar cheese and croutons. Served with your choice of dressing. Corky’s coffee is 100% roasted. Colombian Coffee, fresh and flavorful. Creamy vanilla ice cream smothered in your choice of one of the following – hot fudge, caramel, chocolate or strawberry. We top it off with sprinkles, whipped topping and a maraschino cherry. Chocolate, strawberry, vanilla or caramel. Tender, flaky pie crust filled with crisp apples. A La Crescent favorite! A toasted slice of all-butter pound cake, topped with vanilla ice cream, hot fudge, caramel, whipped topping, a maraschino cherry and toasted pecans. Creamy vanilla ice cream and a rich chocolate brownie drizzled with hot fudge sauce and crowned with whipped topping, sprinkles and a maraschino cherry. Creamy vanilla ice cream, covered with our own hot fudge, caramel, toasted pecans, whipped topping and a maraschino cherry. Creamy vanilla ice cream is smothered in Corky’s hot fudge and laced with Spanish peanuts. Served with whipped topping and a maraschino cherry.